A new Mansfield Fellow has arrived! a new Mansfield Fellow from the 8th group has recently joined our staff. Hello, my name is Adrienne Vanek. I'm a Mansfield Fellow (Group 8) from Washington, D.C., USA. Because I worked for former Texas Senator Phil Gramm on trade- and finance-related issues, I am particularly interested in learning more about the formulation of Japanese trade- and finance-related policies. I am very grateful to Congressman Eto (and his staff) for allowing me this opportunity to do a rotation with him. Although it has only been one week, I have learned much from my new colleagues. Hopefully they are learning from me, too! Here is a little glimpse of what I've been doing this week. The first day of my rotation at Representative Seishiro Eto's office was quite busy spent reparing for his upcoming "Early Bird Seminar",a morning meeting/fundraiser held once a month, to be held on February 20th. The seminars are organized by the Congressman and offer approximately 200 guests the opportunity to listen to guest speakers discuss their views on the latest pressing issues. Professor Morimoto from Takushouku University will discuss Japanese participation in the reconstruction of Iraq and various North Korean issues at this month's seminar. I began research for my new project, that is, to set up an "Ask Seishiro" corner on the Congressman's website that will feature my interview with Congressman Eto. One of the highlights of the day was eating delicious "inoshishi nabe" (or boiled wild boar) for the first time at a reception in Toranomon. The reception was sponsored by the Diet Member's League that deals with crop destruction due to pests and wild animals (including wild boar.) 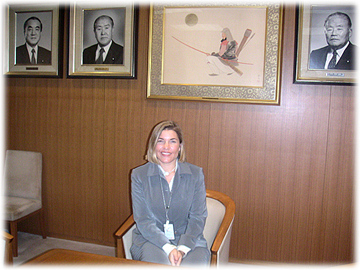 The other was touring the Liberal Democratic Party (LDP) headquarters where we took lots of pictures, including me sitting in the LDP President's chair. Today's highlight was touring the Diet Building for more than 2 hours (I had lots of questions!) I was particularly impressed with the beautiful floor mosaic at the top of the Central Entrance Hall, and, of course, the Emperor's Room. After Japanese class, I spent the day working on this little website project! The Mansfield Fellowship Program - named after Mike Mansfield, former U.S. 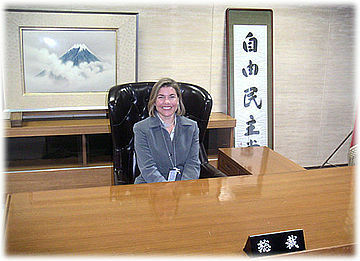 Ambassador to Japan, Senate Majority Leader, U.S. Senator and U.S. Congressman from Montana - were created by the U.S. Congress in 1994 in order to build Japan expertise in the U.S. government. Through the Fellowships, the Fellows are expected to develop networks of contacts in Japan and an Understanding of the political, economic and strategic dimensions of the Japan_U.S. relationship that can strengthen their agencies' Japan-related policies and programs and help the United States manage its relationship with Japan more effectively. Because I worked for former Texas Senator Phil Gramm on trade- and finance-related issues, I am particularly interested in learning more about the formulation of Japanese trade- and finance-related policies. I am very grateful to Congressman Eto (and his staff) for allowing me this opportunity to do a rotation with him. Copyrights(C) 2004-2012 Seishiro Eto. All Rights Reserved.